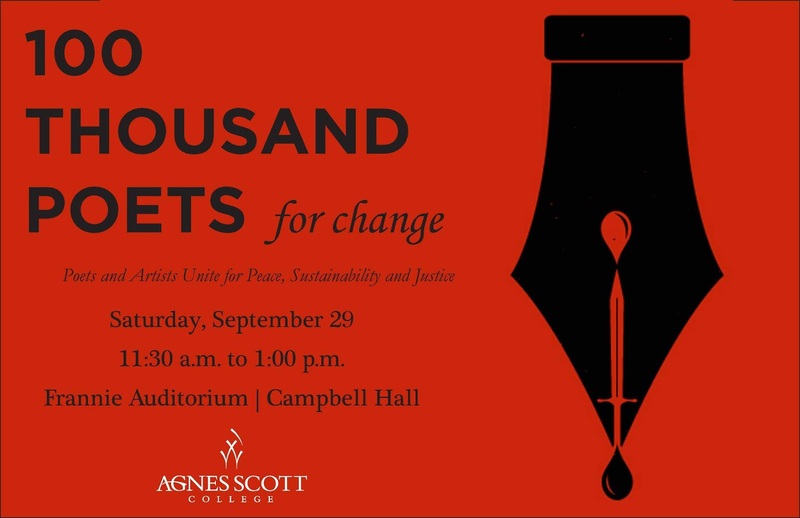 On September 29, 2018, 38 poets convened on the campus of Agnes Scott College to participate in the annual 100 Thousand Poets for Change poetry reading. Dr. Waqas A. Khwaja, a professor of English at Agnes Scott College, hosted and coordinated the program. The diverse poets covered a wide range of community concerns. The inclusive nature of the program meant that participants, from novice to professionals, could read their own works as well as works of other popular poets. Each unique voice shed light on the human condition and our authentic, yet shared experiences. The event was free and open to the community. According to their website, “Since 2011,100 Thousand Poets for Change has been working with poets, writers, artists, musicians… to help organize events around the world for peace, justice and sustainability. “ Their mission includes, “We want to continue to emphasize the need for INCLUSIVITY and true DIVERSITY in our global network.” The website features information on how to schedule and organize an event at your location. I look forward to making this an annual tradition.